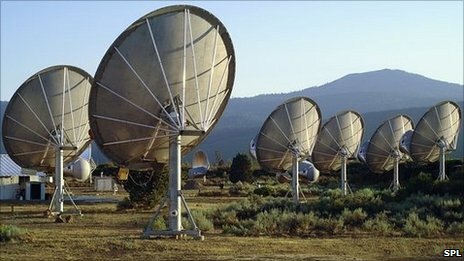 We've all heard of SETI, the Search for Extraterrestrial Intelligence. We're talking here about a search that utilizes the scientific method and that began, in a sense, with the discovery of radio. As far back as 1896 Nikola Tesla spoke about the possibility of using radio to make contact with intelligent life on other worlds. This article by Jason Palmer, writing for BBC News, highlights the suggestion by an experienced astronomer that we may have been looking in the wrong places, for the wrong kind of intelligent life. Writing in Acta Astronautica, he says that the odds favour detecting such alien AI rather than "biological" life. However, Seti searchers have mostly still worked under the assumption - as a starting point for a search of the entire cosmos - that ETs would be "alive" in the sense that we know. "If you look at the timescales for the development of technology, at some point you invent radio and then you go on the air and then we have a chance of finding you," he told BBC News. "But within a few hundred years of inventing radio - at least if we're any example - you invent thinking machines; we're probably going to do that in this century. "So you've invented your successors and only for a few hundred years are you... a 'biological' intelligence." From a probability point of view, if such thinking machines ever evolved, we would be more likely to spot signals from them than from the "biological" life that invented them.